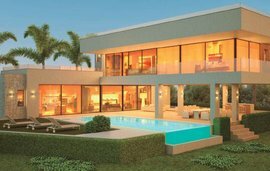 This beautiful new complex will be ready to live in by the end of 2018, It is located in the popular area of La Alqueria , in the hills of Benahavis only a 10 minute drive to Puerto Banus and overlooks the Benahavis golf valley of El Higueral and Atalaya Golf. 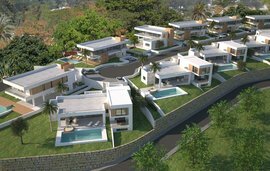 This development offers apartments of 2 and 3 bedrooms all south facing and having country, sea and mountain views as well as acres of unspoiled land surrounding the complex. The accommodation includes an entrance hall with guest toilet, which leads you into a stunning living room with spacious sun terraces offering sea views, there is an open plan kitchen with a centre island and all appliances are by Gaggenau. The design of the bedrooms provides a peaceful setting, offering perfect tranquil views, decorated in soft tones and built in wardrobes, the master bedroom offers direct access to the terrace and views of the sea, the second bedroom has a balcony and separate bathroom. Other features of these amazing apartments are air conditioning, underground garage space and a large storage room. This gated complex has 24 hours security and offers 4 swimming pools and a recreational area. This urbanization also offers concierge services, cleaning and laundry services, shopping delivery requests, private chef services, arrangements for car rentals and all other types of services adding the extra touch of relaxation and luxury.